With the scaffolding completely gone around new rental building 7950 Sunset near West Hollywood, the retail space awaits its tenants and the new sidewalk area awaits your critique. For some perspective of this so-called connective tissue, down the street you've got the brunch lines of The Griddle and up the street, you've got the mini-malls. (And surely the word connective tissue was never used to describe such a pedestrian scene.) 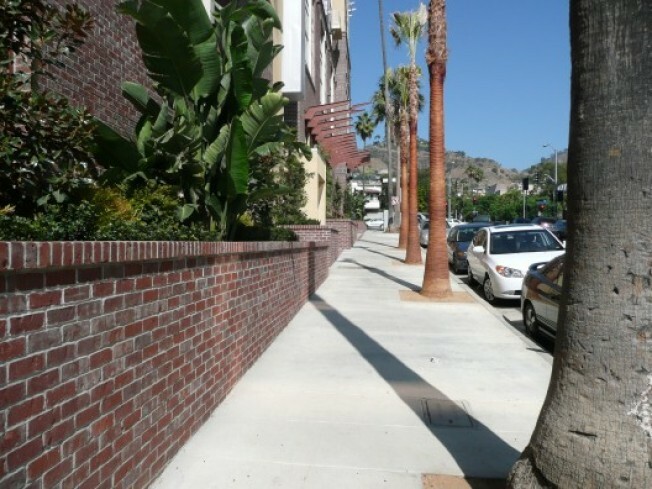 Notably, developers set back the stores (there's some nice shade provided), while the brick wall along the sidewalk (down the hill, off Sunset) rises at different angles. The only mystery: Those maroon-colored fork-looking things jutting from the building. Awnings? Clotheslines?